Demand Clean Water for Flint and Across the U.S.
Two years ago this month, officials in Flint, Michigan, flipped the switch on the faulty new water system that led to the tragic lead contamination of the city's drinking water. Yet Congress has failed to provide the city's low-income families with the clean water they desperately need. Making matters worse, we've learned that Flint isn't alone: People across America are exposed to lead-tainted water. Enough is enough. Tell Congress to provide the urgent aid needed to fully address Flint's drinking water crisis and make sure all Americans have access to clean, lead-free drinking water. 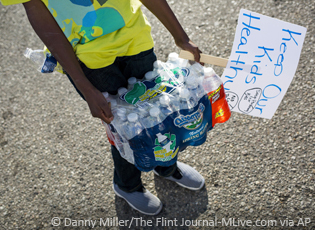 Tell Congress to provide the urgent aid needed to address Flint's drinking water crisis and make sure all Americans have access to clean, lead-free drinking water. Clean up water in Flint and across the U.S.
Dear legislators: Congress has failed to fund an aid package to clean up the lead-tainted water that has plagued residents in Flint, Michigan for more than two years. But the health of 100,000 people is not a political game -- and I urge you to provide Flint with much-needed aid so that the city can recover. But that is only the beginning. In cities and towns across the country, residents get contaminated water when they turn on the tap. This risk to our health is preventable and it is unacceptable. That's why I'm asking you to also take bold action to strengthen our drinking water laws and start updating America's deteriorating public water system. Your responsible leadership on this issue is critical to ensure that all Americans have access to safe drinking water. Thank you.